A 21-gun salute has been fired in Buckinghamshire to mark the moment the new Duke and Duchess of Cambridge left Westminster Abbey as man and wife. Two big guns boomed from Coombe Hill, near Wendover, at 1200 BST. A military re-enactment group called the Garrison Artillery fired the vintage 25-pounder artillery pieces. 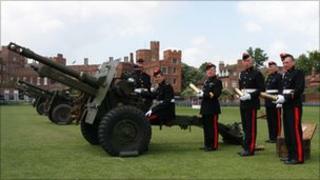 The guns arrived from their armoury at Larkhill on Thursday night and were placed under armed guard at RAF Halton. Lt Col Simon Wilkinson, who co-ordinated funding for the event, said: "These type of guns used to be fired by the Royal Bucks Yeomanry, who last fired them in 1966. "Some of the veterans will be on the firing point near the Coombe Hill Monument by Wendover to see them in action. "The 21 loud bangs will be heard for miles around as the two guns commence firing, when the happy couple leave Westminster Abbey as husband and wife." The event was supported by the National Trust, RAF Halton and Buckinghamshire County Council. Pet owners were urged to keep their animals indoors and horse riders to avoid the area in the brief time the guns fired.